Grandmother of Laura Jane Munson. Anna Marion Fairfield called Ruth a "child of sorrow." She was the only child of Ed and Minerva Fairfield. (Ruth's daughter Ruth Anna says that her mother told her there was an older brother who died at birth, but no evidence is found. Ruth's birth certificate says she is the first child born to them. However, birth records from that era were ill-kept and not very reliable according to Allen County sources.) Her mother died from complications of childbirth when Ruth was 24 days old. At that time, her name was changed from Ruth Anna to Ruth Minerva to honor her mother. Soon after her birth, Ruth was taken by her aunt and uncle, Sadie and Broadwell Bell, to live with them in St. Louis. The understanding was that it was to be her permanent home. The first nine years of her life were priveleged. She had a wonderful home and was receiving a fine education, studying foreign languages, etc. She loved her Aunt Sadie, Uncle Broad and Cousin Frank. At some point, they moved back to Fort Wayne to live, and Ruth was doted on by her Grandpa Cordrey and her many aunts who lived there. Her father Ed had little contact with her, but when he bought land in Brazoria County in 1908 and decided to move his family - he had since remarried and had other children - he made the decision to take Ruth with him. This caused much bitterness. Sadie never spoke to her brother again, and Grandpa Cordrey couldn't believe he was taking Ruth to that "God forsaken country." He was so concerned about her future, he made provisions for her education in his will and left her a substantial portion of his estate. Furthermore, he ignored instructions that Ruth was not to know that Ed's new wife was not her natural mother. Later Ruth rose up in an act of childish defiance, telling her stepmother that she didn't have to mind her because she wasn't her real mother. Evidently angry letters flew between Brazoria County and Fort Wayne for a time. So a much loved and pampered little girl boarded the train in Fort Wayne with her stepmother and half-sisters for life as a farm girl in Texas, wondering how her father, who was already there, would recognize them. She would never see Grandpa Cordrey again. Ruth was a beautiful little girl. 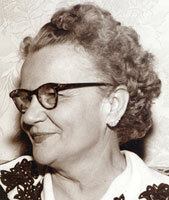 She had thick blond braids and blue eyes, perhaps an influence of her German grandmother, Christeann Gramlich Cordrey. She was probably ill-suited for a harsh farm life. Her father was a hard worker and good provider, but a real taskmaster who treated her harshly. He always called her "Jack", a nickname devoid of any affection. She would always believe that he blamed her for her mother's death, and swore that he kicked at her on his death bed. On the other hand, she was treated kindly by her stepmother, and of her siblings, she was particularly close to Della who was nearest her own age. It was not surprising that she married young. Ruth and Bill lived in Lochridge and Sandy Point. When Bill left home, she was left to raise four children on her own. She became Postmistress and kept the store at Sandy Point. She divorced only because she was advised that she would lose everything if she did not. Ruth was not a domonstrative personality, but looking back, Ruth Anna says that she knows her mother loved them because she provided for them and insisted they stay in school during the difficult days of the depression. The stories of her youth related here, she told to Ruth Anna Munson in her later years, matter of factly, and with more sadness than bitterness. After all her children left home, Ruth moved to Houston. She married George Preston Renfrow there in 1944. Preston's first wife was Ruth's half-sister Edella who had died of cancer. They lived in Houston in the Renfrow home on Jack Street. After Preston died, Ruth moved to Pasadena, Texas, to be near her son Charles and his family. She suffered a fatal heart attack and died at Pasadena Bayshore Hospital. She is buried beside Preston at Forest Park Lawndale Cemetery in Houston. Children of Ruth Minerva Fairfield and William Lemuel Horn Jr.
[S506] Ruth Minerva Fairfield entry, Allen County notarized affadavit sworn and subscribed to on 24 July 1943 in Allen Co., IN by Ruth M. Horn per advice from the Allen Co. IN Health Commissioner as to her birth name, present married name, and correct maiden name of her mother; to be attached to her birth certificate, and intended as a correction of same, Board of Public Health, Fort Wayne, Indiana. [S501] Ruth M. Renfrow entry, Harris County Deaths, 511, Texas Dept. of Health-Bureau of Vital Statistics, Pasadena, Texas. [S505] "Baby Book of Ruth Minerva Fairfield," (MS, 1899-1907; Fort Wayne, Indiana), Charles Horn; Pasadena, Texas. Events surrounding the first few years of Ruth's life were recorded in this tablet by an aunt, probably Hannah (Cordrey) Bitner, and given to Ruth's son Charles by Hannah Bitner's daughters, Coreinne and Mildred of Fort Wayne, Indiana, in the 1980s. [S507] Ruth M. Fairfield, Allen County Probate drawer 3732, County Clerk's Office, Fort Wayne, Indiana. [S503] Ruth M. Renfrow Family Papers, 1899-1972, Charles Horn, Pasadena, Texas. [S29] Ruth M. Renfrow, no. 452-36-3194, Social Security Death Index, RootsWeb (Provo: MyFamily.com Inc., 2005). The SSDI component of RootsWeb is drawn from the Social Security Death Benefits Index of the U.S. Social Security Administration. [S502] Renfrow-Horn marriage, 9 October 1946, Charles Horn, Pasadena, Texas. Certificate copy from Charles W. Horn, citing no book or page number. [S778] Broadwell C. Bell household, 1900 U.S. Census, City of St. Louis, Missouri, population schedule, St. Louis, enumeration district (ED) 304, sheet 10B, dwelling 124, family 184; National Archives micropublication T623, roll 897. [S50] Ed Fairfield household, 1910 U.S. Census, Brazoria County, Texas, population schedule, enumeration district (ED) 7, sheet 12A/46, dwelling 161, family 161; National Archives micropublication T624, roll 1534. [S975] Francis Cordrey will (1914), Allen County Wills, County Clerk's Office, Fort Wayne, Indiana.